For Mary Welsh, moving to the countryside after living and working in London was a delightful change of lifestyle. She set off on her walks, delighting in the hills, the rivers, the birds, the plants and the trees. She recorded all she saw and the guidebooks began, illustrated brilliantly by her friend Christine Isherwood, who walked with her. Mary has now written more than forty books of walks. 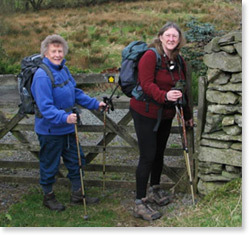 Walking and natural history have been Christine’s passions for as long as she can remember. Drawing and painting were also early interests and the series of guides to walking in Scotland offers a happy synthesis. She enjoys the opportunity to explore both popular and less well known areas and takes a special delight in finding the most appropriate illustrations for each walk.